We are seeking old keys that are no longer needed to inspire others art and writing. Please consider donating them to this community engagement project. 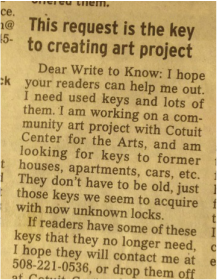 Cape Cod Times Write to Know section asking for used keys. It was as if people were waiting to give them to someone who would use them. Now we need more. Can you help? Please consider a donation ​to community art. Financial donations sustain this program. ...and we need a van, we are on the move.